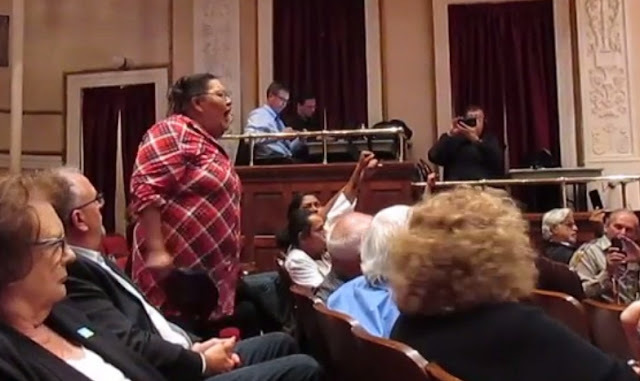 Water Protectors Boldly Disrupt Governors' Debate Speaking Truth to Power in Bismarck. "We will never allow this pipeline - Not Now - and Not Ever! " Water Is Life. DAPL protesters interrupt a debate between candidates for ND governor in Bismarck after a question was asked about the pipeline. The moderator asked for calm. A debate between the candidates for governor in Bismarck was disrupted Monday night by Dakota Access Pipeline protesters. A crowd estimated at around 150 gathered outside the Belle Mehus Auditorium downtown. They carried signs and made speeches. Several went into the auditorium for the debate. After the three candidates answered a question on the pipeline, the shouting started. The moderator, Dickinson Press publisher Harvey Brock, then asked for calm. Bismarck police ushered several protesters out of the auditorium. Others left voluntarily. No one was arrested. Responses to "Water Is Life: Native American Water Protector Interrupts Governors' Debate"